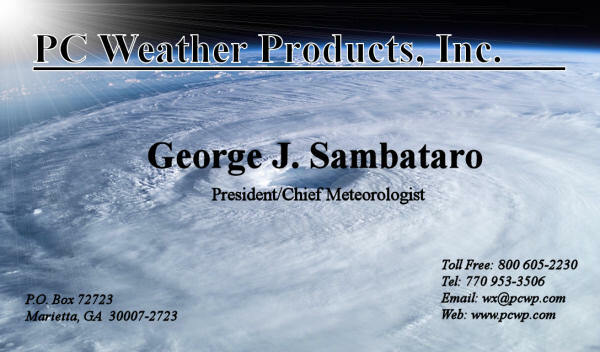 Founded in 1992, PC Weather Products grew out of years of research and development headed by George Sambataro to find a more comprehensive way to track and analyze tropical storms and hurricanes on a personal computer. This work resulted in PC Weather Products and the line of HURRTRAK Products and services. Today, PC Weather Products specializes in Windows based Hurricane Tracking and Analysis software and services designed and used by individuals and professions from all types of industries.. both governmental and public/private corporations. They include risk/emergency management, insurance, and disaster planning specialists. The company's premier software products, HURRTRAK ADVANCED, HURRTRAK RM/Pro, HURRTRAK EM/Pro offers an advanced set of functions and capabilities related to the analysis of Atlantic tropical systems as well as their potential impact to land/sea areas. HURRTRAK-ONLINE is the company's on-line service which provides all of the latest National Hurricane Center information, via an internet connection, to the HURRTRAK Systems. HURRTRAK Advanced, Global RM/Pro and Global EM/Pro cover tropical cyclone from around the world. In 2016, the company introduced Severe Weather Alerting capabilities. As part of the Hurrtrak software, the user can also be quickly notified when severe weather is approaching. It is a highly customizable, valuable addition to the Hurrtrak software suite. The company's premier information service is StormInfo. StormInfo is a web/email based offering which delivers storm graphics, text, reports and expert analysis via the web and custom "personal" storm impact reports via Email. It is the perfect solution for individuals that need the information fast but don't want to run application software to get it. Our corporate mission is to lead the industry in the development of the highest quality tropical cyclone tracking and analysis software. PC Weather Products will strive to bring to the market the most innovative and technically superior products and services that will provide the greatest possible value for our customers. PC Weather Products will listen to our customers attentively, support our products actively, and seek to satisfy needs continually. NEW versions of the HURRTRAK software are now available for ordering. Call us at 800 605-2230. Copyright ©2018 PC Weather Products, Inc., All Rights Reserved.